« Are Programmable Thermostats Green? With a baby in the house, we’re pretty careful about what chemicals we use, and paint was high up there on our list of concerns. Made from petrochemical sources and full of stinky volatile organic compounds, regular interior paint can seem pretty shady when you’re thinking of your home improvement from a green point of view. One sniff in a freshly-painted room and you can’t deny that you’re probably breathing in some not-so-great gasses. 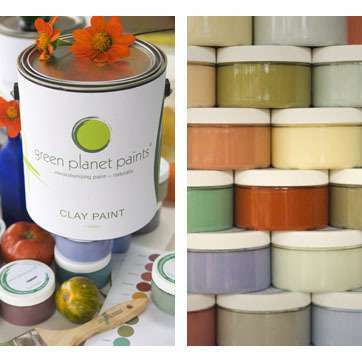 That’s why we’re big fans of Green Planet Paints, a line of ecological, clay-based, no-VOC paints developed in southern Arizona. Their non-toxic, plant-based paint formula combines 11 ingredients including water, marble, porcelain clay, mineral pigments, and a soy-based resin. You can breath easy while you’re painting. You can paint with kids present. And unlike the no-VOC paints of the past, which only came in boring pastel colors, Green Planet Paints can color match just about anything in their flat, eggshell, and semi-gloss finishes. Have you tried the new no-VOC paints? How did you think they compare to standard paint? This entry was posted on Friday, December 10th, 2010 at 5:11 am by Christa and is filed under Green Living, Housing, Organics. You can follow any responses to this entry through the RSS 2.0 feed. Both comments and pings are currently closed. Actually, they have a line of no-VOC paint at Home Depot now, and there’s one at Lowes, too (which has a better selection of colors and will do color-matching). The Home Depot selection isn’t great – too many pastels, but if that’s what you have nearby the prices are at least reasonable. Way better than ordering something online and having it shipped!